Not sure which type of dry erase board is right for you? We offer an easy Surface Comparison guide to help you decide which surface suits your needs best. Our Tuf-Rite boards are great for light-use areas like factory floors, break rooms and low-traffic work spaces. Although these boards are some of our most affordable options, they are still guaranteed to last for a minimum of five years, with many lasting much longer. If you need something for a personal workspace or training room, consider the Magne-Rite surface; it’s magnetic and durable enough to withstand frequent use. For a moderate use situation, get the non-magnetic Dura-Rite whiteboard featuring a wear-resistant and dust-free surface at an affordable price. 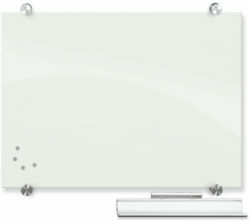 We also carry magnetic porcelain steel whiteboards, which are some of the finest types of whiteboards currently available. Perfect for churches, schools and offices, these heavy-use boards are guaranteed to last for 50 years without scratching, staining or ghosting. In addition to offering a variety of whiteboard surfaces, DryEraseBoard.com also carries a number of specialty boards for our customers' unique needs. 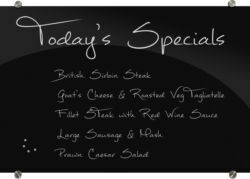 Our modern glass and acrylic dry erase boards have a clean look. 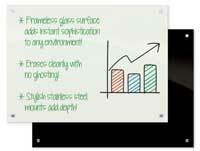 If you need a whiteboard that also works with a projector, consider our evolution markerboards. 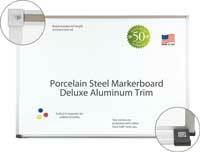 We also have portable and reversible marker boards that can be easily moved thanks to a sturdy base with wheels. 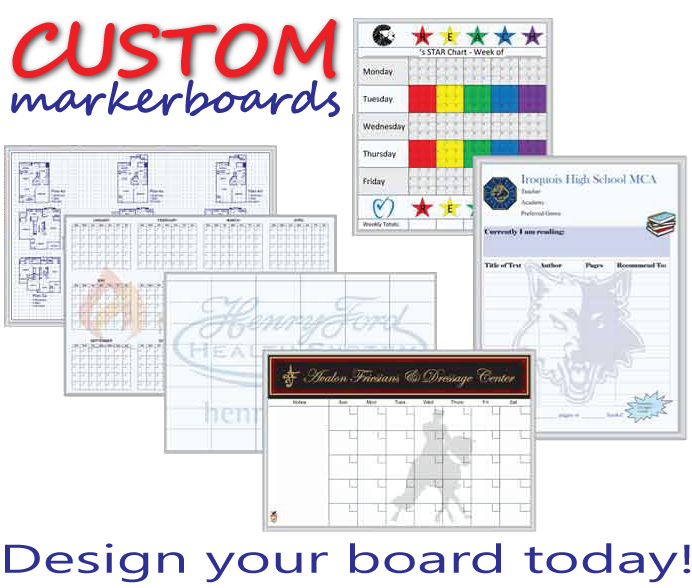 At DryEraseBoard.com, you can also create a custom dry erase board for your classroom or office with stock graphics or a unique logo. 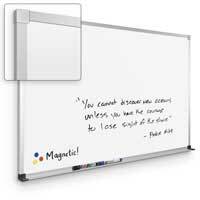 Find the perfect white board today at DryEraseBoard.com.